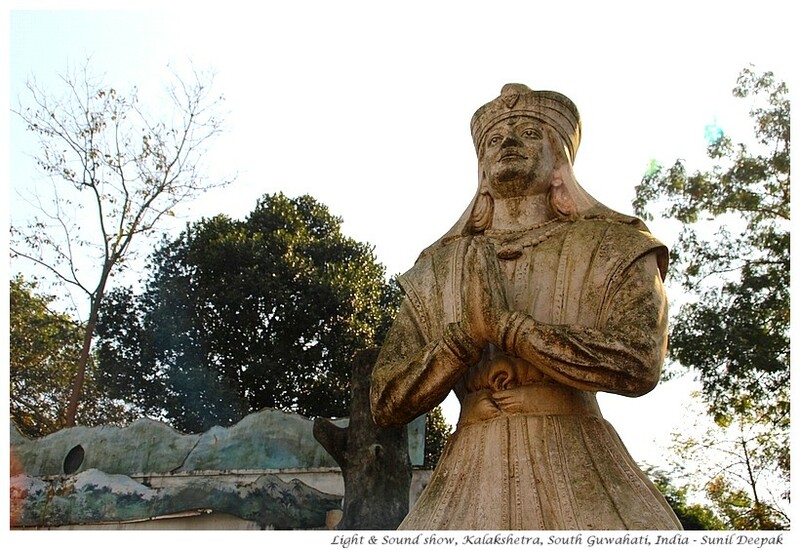 Guwahati is known mainly for the Kamakhaya temple. Visitors to the city, also like to visit three other temples – Bashistha, Nobograha and Umananda. Most persons, even those living in Guwahati, are not aware of other places to visit in the city. This post is about places to visit in South Guwahati, which includes Dispur, the capital of Assam. The image above shows sculpture of a Bhaona figure from the stage used for Sound & Light show at the Shrimanta Shankar Dev Kalakshetra, an important cultural centre located in South Guwahati. Apart from the Kalakshtra, this visit will take you to a famous temple, the cathedral, some museums, an important cultural centre and to see some wildlife. So let us start this visit with some general information about South Guwahati. All the places described in this post can be reached easily through public transport of the city – by buses that run along the G.S. road. Guwahati city started on the south bank of Brahmaputra river. In pre-independent India and for a few decades after independence, the whole of the north-east (NE) was part of Assam state and its capital was in Shillong. In ancient times till around medieval period, it was known as Pragjyotishpura. During British times, it was called Gauhati. Since the NE was important for its tea gardens and timber, Gauhati was an important city for the British because of its river port and its railway station, that linked the north-east to the rest of India. In 1972, the north-east was divided into different states including Meghalaya, Arunachal Pradesh and Mizoram. Shillong became the capital of Meghalaya, while Gauhati became the capital of Assam. In 1973, its name was changed to Guwahati and Assamese Government decided to move its capital to the southern outskirts of Guwahati city, to Dispur. Guwahati-Shillong road (G.S. road) is one of the main arteries of the city, starting from the Guwahati railway station in Paltan Bazar and going southwards for about 7 miles till Khanapara, where Assam meets Meghalaya and the terrain becomes hilly. The G. S. road in the city has four flyovers. Coming from Paltan Bazar, the third flyover, Ganeshguri flyover, marks the boundary of old Guwahati and the beginning of Dispur. Thus, south Guwahati starts from Ganeshguri flyover, continues over Six Miles flyover and finishes at Khanapara, where G. S. road joins NH 37. With the widening of G. S. road and the building of the flyovers, Dispur and Six Miles are no longer considered as outskirts of Guwahati, rather they are part of the main city. I will start my walking tour from the famous Ganesh temple of Ganeshguri. It is located on the road underneath the Ganeshguri flyover, to the right if you are coming from Paltan Bazar. Ganeshguri has a vibrant market and it has some of the famous restaurants where you can get traditional Assamese food. Ganesh temple was built here to mark the entry to the city of Kamakhaya, one of the incarnations of Parvati, the consort of lord Shiva. According to the Hindu mythology, Shiva had left for a journey when Ganesh was born. When Shiva came back, he found the boy blocking his way, since the boy did not know his father. In anger, Shiva cut off the head of the boy. Only when Devi told him that he had killed his son, Shiva promised to bring the boy back to life, but in the meantime, animals had taken away boy’s head. Thus, Shiva sent his followers to bring back the head of first baby they could find and his followers brought him back the head of a baby elephant. Since then Ganesh has the head of an elephant. Thus, the baby Ganesh of the Ganesh temple of Ganeshguri is guarding the entry to his mother’s town. It is a small temple, with most of its statues being placed outside on its walls. Inside the temple, Ganesh is shown as a natural uncarved rock covered with vermillion. At different religious festivals, this temple and the whole area is crowded with believers. I am more of a spiritual person and I do not feel particular devotion when I visit temples. Rather, I have an anthropological curiosity to understand the rituals. However, among all the Hindu gods, Ganesh is my favourite since I feel that he represents the unity of man and nature, and asks us to be respectful of the nature. 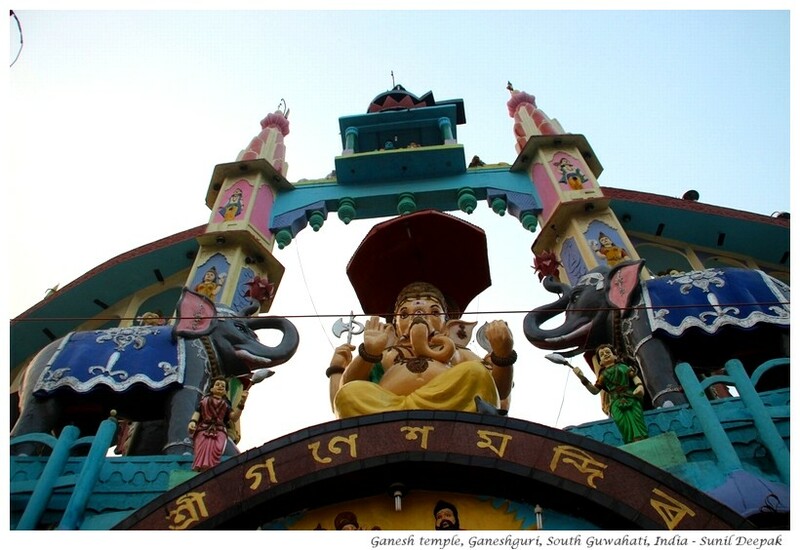 The same road of Ganesh temple, on the other side of the flyover will take you to Chandmari and the Guwahati zoo. (BTW, Assamese language lacks the ‘ch” sound of ‘church’, thus Chandmari is pronounced as ‘Sandmari’). To reach the zoo, you should take a bus from the Ganeshguri crossing. The zoo of Guwahati has a beautiful location, with hills, forests and canals. Some water birds and animals have open enclosures separated by moats so that they can be seen properly without any barriers. Some enclosures of the zoo give an impression of being a safari park. For example, the elephant enclosure has a small pond at the edge of a dense green forest, and is very beautiful. However, here it is difficult to see the elephants unless they come out of the forest to drink water at the pond. Similarly, the raised up view-platform of the tiger enclosure is a good place to observe these animals, while ensuring visitors' safety. Unfortunately, most enclosures in the zoo are old fashioned, ugly looking iron grills or nets. Many sign boards are missing and overall maintenance of the zoo seems to be poor. Assam is full of wildlife and wildlife parks. Compared to that experience, visit to the zoo can feel a big let-down. With a bit of effort, Guwahati can have its own wildlife park inside the zoo, with a better view of the birds and animals. Perhaps, the zoo officials can visit the city wildlife park of Nairobi (Kenya) to get some ideas about how it can be done. The zoo also needs to make more efforts to teach visitors about importance of nature and how to behave with the animals and birds. The Assam State Assembly, a short distance away after the Ganeshguri flyover, is not accessible to visitors because of safety concerns. This part of Guwahati is called Dispur. The place has armed police guarding it, so you can just look at it from far away. Many Assamese are very particular about Dispur being their state capital and not Guwahati. However, it is difficult to tell the boundaries of Dispur. It is just one of the bus stops for the Guwahati buses. 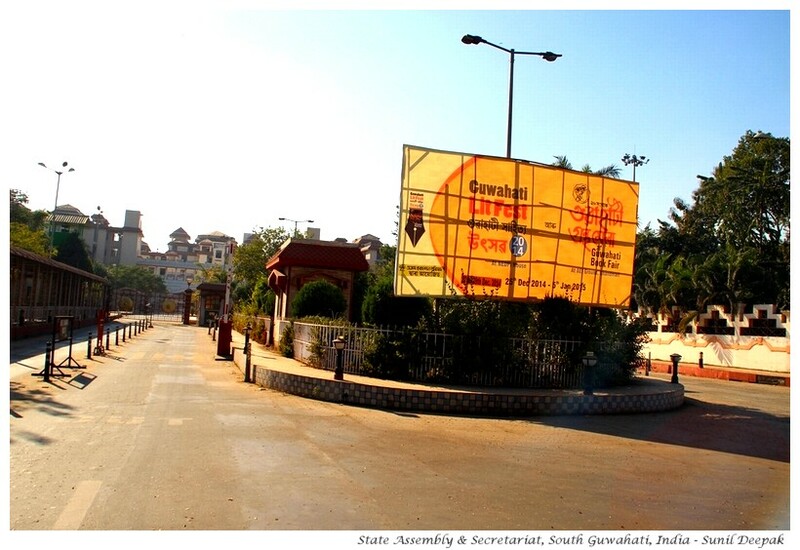 The road next to the State Assembly leads to an area of Guwahati called Beltola. 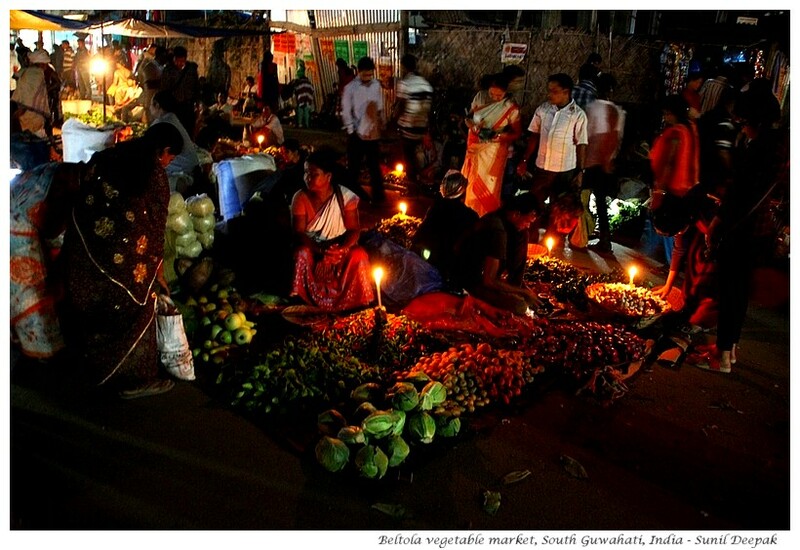 The road connecting Beltola to Jayanagar holds a roadside market, especially a vegetable market, every Thursday and Sunday. Farmers and tribals from all around, including the neighbouring Meghalaya, bring their produce to this market. 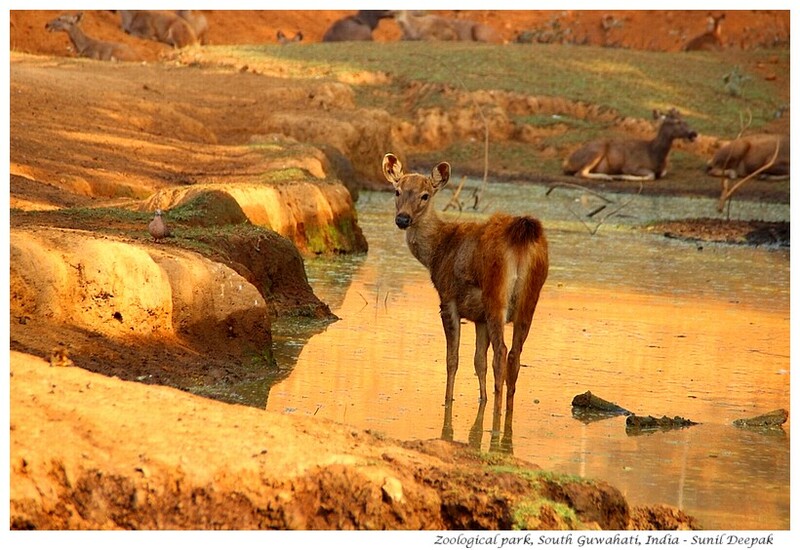 It also provides a glimpse into the wonderful biodiversity of India. You can see tens of variaties of each common vegetable here, something that does not exist in any supermarket. In my opinion, this market represents a wonderful tradition and hopefully, the authorities will safeguard it and not destroy in their search for soulless ‘development’. The image above shows one of the market stalls at night. I have read that Beltola was a small kingdom till early twentieth century and it had the palace of its king. However, in spite of asking to a lot of persons, I could not find more about the king of Beltola and his family house. Like so many old traditional heritage houses, replaced by concrete buildings, it is a part of the lost history of Guwahati. The cathedral of Guwahati is located close to the Six Miles flyover, a short distance after Dispur, on the right side of the road. It is of a recent construction and has a utilitarian architecture, thus it is not very impressive from the outside. Inside, the paintings behind the altar and the coloured glass windows, make it look much better. The cathedral is venue of a large gathering of the faithful in November each year for the festival of Christ King, when Catholics from all neighbouring cities and towns come here to hold a procession. 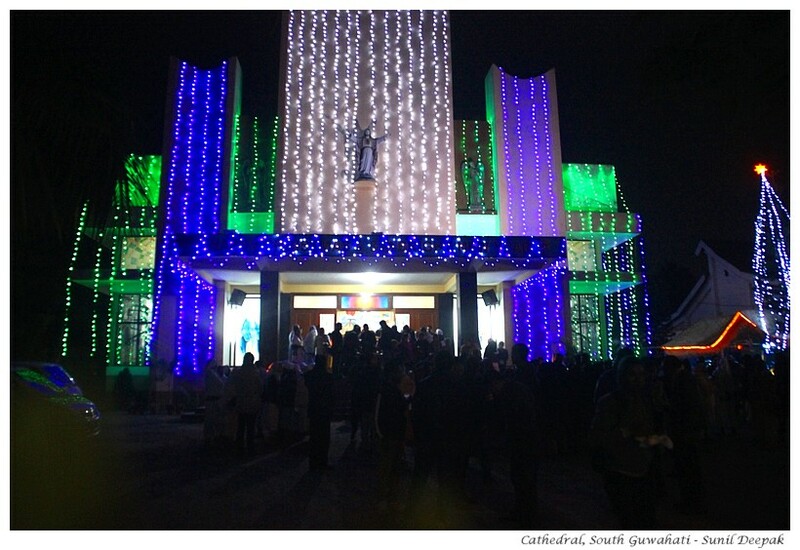 The image above shows the Christmas lighting at the cathedral. 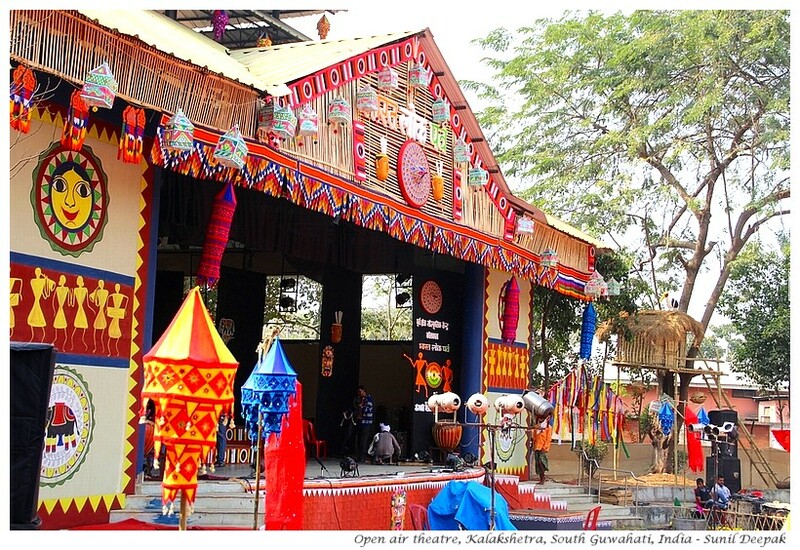 Kalakshetra is one of the most important cultural centres of Guwahati. Inside, it has different museums, galleries, a daily Sound & Light show about history of Assam and has a rich calendar of cultural events. Kalakshetra is located in Punjabari, on the road underneath the Six Miles flyover. It is a couple of kilometres from the flyover. Near the flyover, you can get a Punjabari bus which will drop you in front of its entrance. The idea of setting up of the Kalakshetra was of Bhupen Hazarika, considered to be one of the most important contemporary cultural icons of Assam. 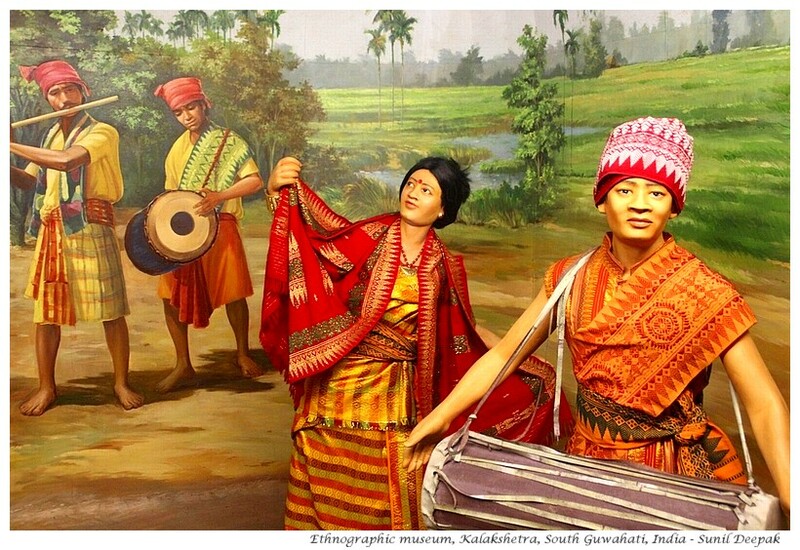 It includes a beautiful ethnographic museum and an art gallery with works of contemporary Assamese artists. It also has a small but nice auditorium. The image below is from the ethnographic museum. 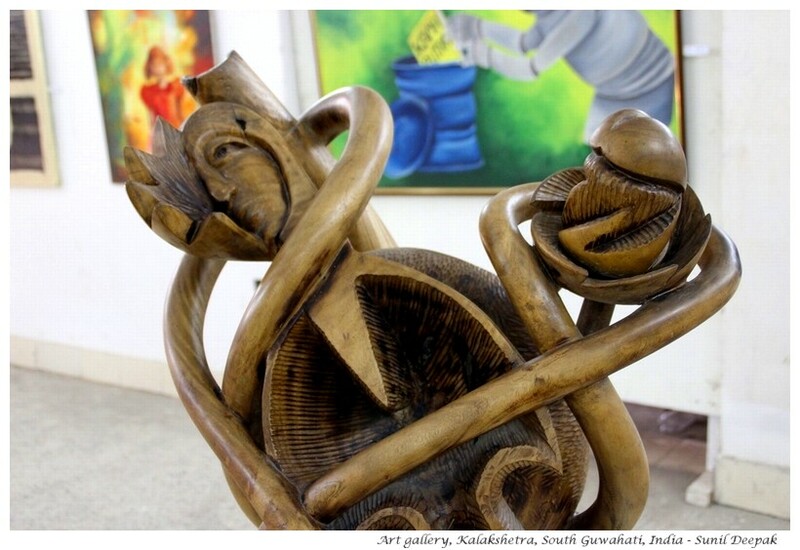 The above image is of a sculpture by Dhan Singh Basumaty from the art gallery of Kalakshetra. During my stay in Guwahati, I was fortunate to be able to watch some wonderful cultural performances in Kalakshetra. Unfortunately, it does not have a proper website with updated information and a calendar of its cultural events. Thus sometimes I found that its beautiful events did not have a big audience, even if they were free, which was a great pity. 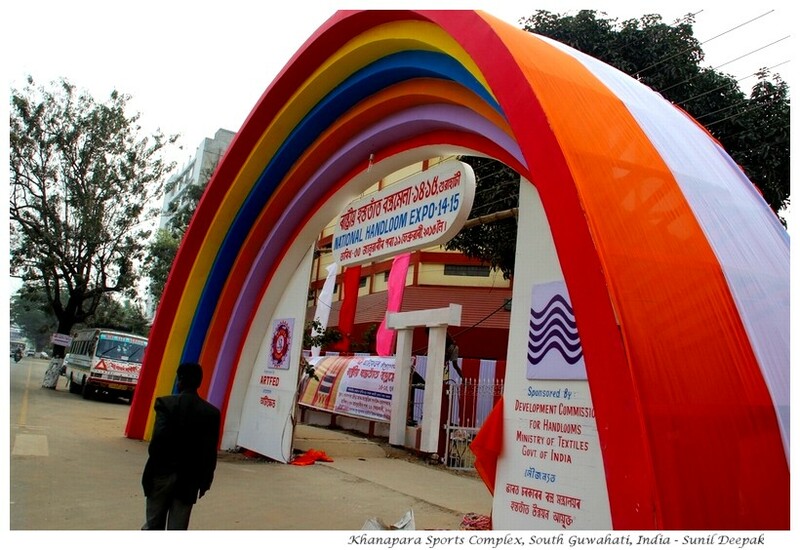 Shilpagram, located close to Kalakshetra is a venue for handicrafts exhibitions and trade fairs. It is a beautifully made structure with nice traditional buildings. It also has a small auditorium and an open air space, often used for music concerts. 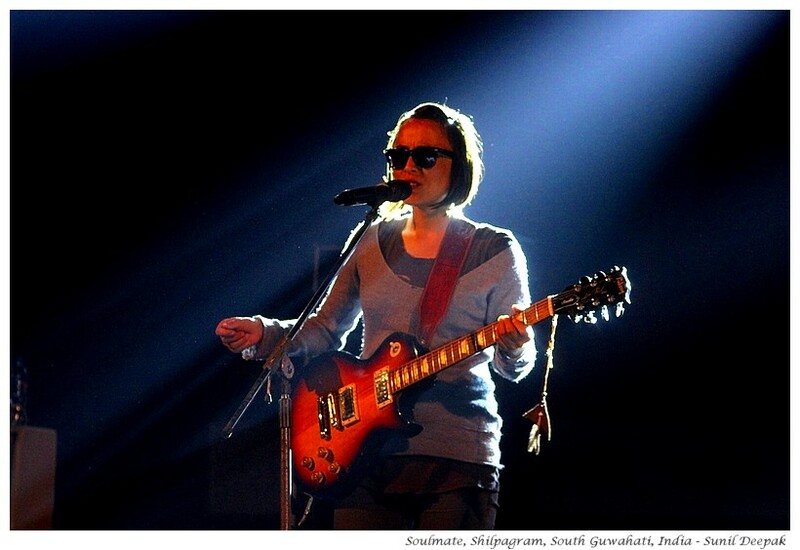 The picture below has a singer of the NE music group called Soulmate during a performance in the open air theatre of Shilpagram. Swami Chinmoy Mission and the Guwahati film museum are both located in the small lane next to Kalakshetra that takes you to Shilpagram. I am not sure if the film museum is open for visitors. All the times I passed in front of it, it was closed. Khanapara sports complex is located on G.S. road, about one kilometre after the Six Miles flyover, on the right side of the road. A couple of times, I saw cultural programmes in the stadium hall of this complex, but never saw it being used for any sports meets. The grounds of the sports complex are a popular venue for trade fairs, handicrafts shop fairs and Bihu celebrations, like the handloom fair shown in the image below. 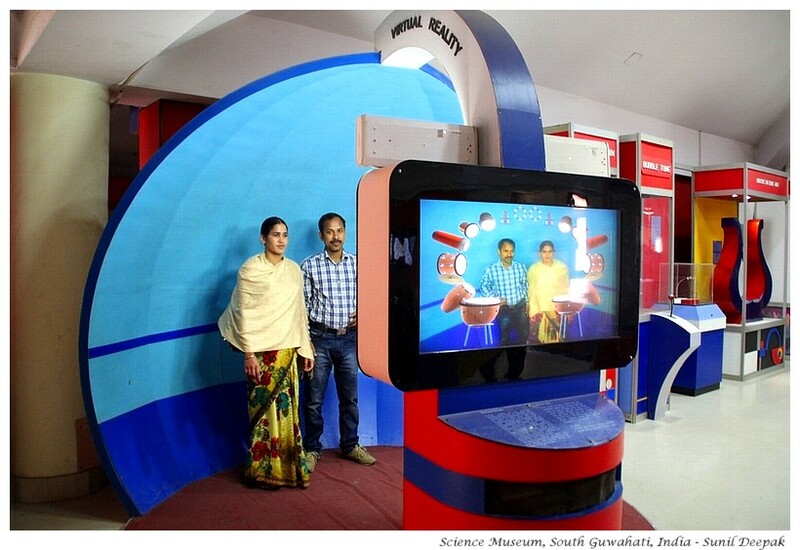 The Science Museum of Guwahati is located on a small side-road of G.S. road on the left side, a little after the new Vivanta Taj hotel building. The science museum is full of things to discover, both for children and for adults. Some things of the museum are quite low-brow, including the “deforming mirrors”, where you can look at your deformed shapes and laugh at yourself (predictably, the low-brow things are very popular with the visitors!). Other things are more high tech. 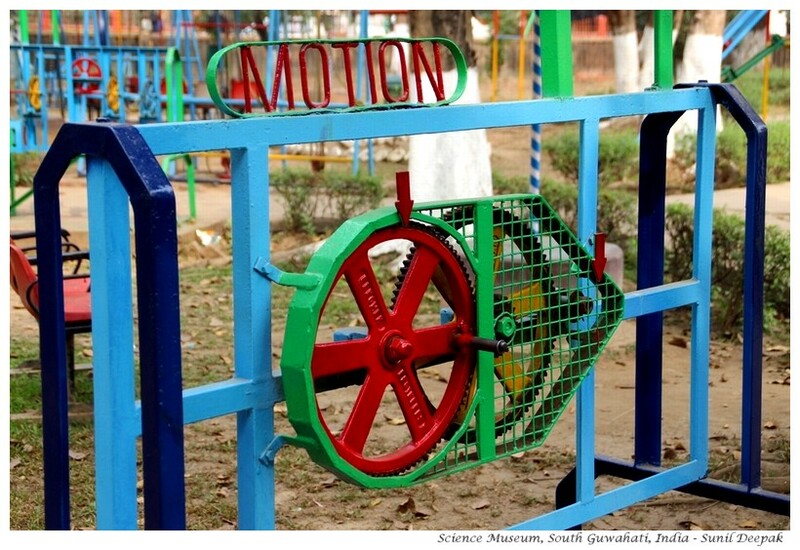 Outside the museum, the gardens have many other things to see including an aeroplane and some robust machine models to understand functional mechanics, such as the pulleys in the image below. 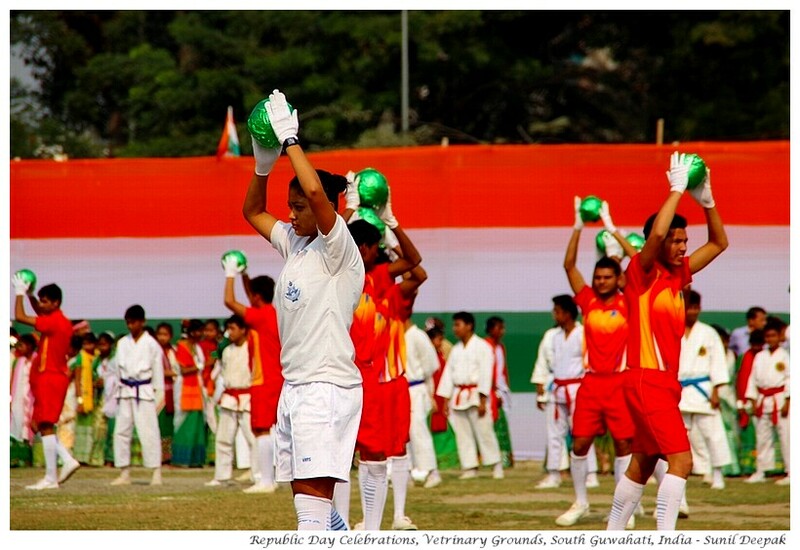 The grounds of the veterinary college of Guwahati, some fifty metres further down the road from the Science Museum are venue for big events such as the republic day parade and the annual horticulture fair. Every morning and evening, the road near the veterinary grounds is closed to traffic and hundreds of local residents use it for their morning or evening walks. The house of the chief minister of Assam is located on the hill, just behind the veterinary grounds. This area also has the office of the Assam Public State Commission while the veterinary college on the G. S. road has the Khanapara post office. Finally, the nearby Khanapara-NH crossing has buses, shared taxis and other vehicles for all the major towns of the north-east. If you have only a little time for sight-seeing in Guwahati, you can give a miss to most of the places described in this post. However, if possible, you should at least visit Kalakshetra. Like many cities of India, Guwahati also has antiquated laws regarding photography for entry in many places presented in this tour. Rather than accepting and using the selfie culture and photography for providing free publicity through social networks, they prohibit photography and ask persons with cameras to pay extra. In a world where everybody clicks pictures with their smartphones, is it really logical to ask persons with cameras to pay? Let me end this visit with a question. The image above has some of the famous Indian scientists from the Science Museum. 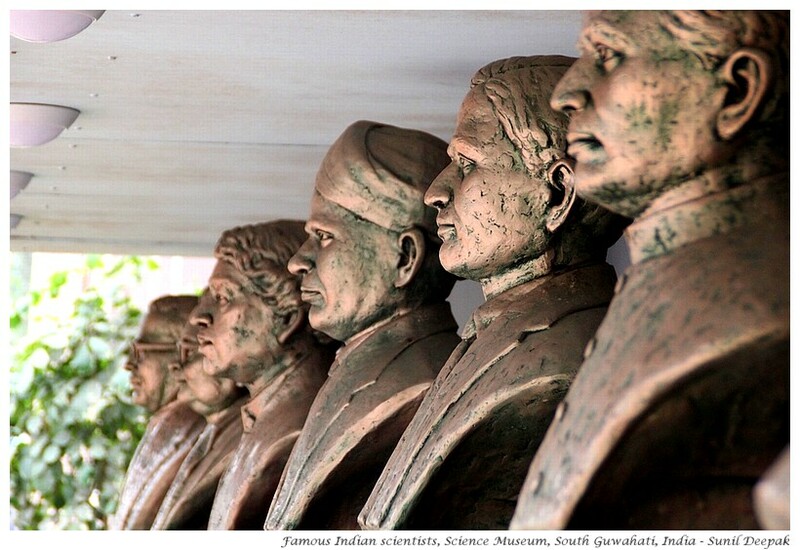 When I saw the statues shown in this image, I was able to recognise only Raja Ramanna and Homi Bhabha. How many Indian scientists can you recognise in this picture? If you are looking for information about other places to visit in Guwahati or in the NE, check the list of my blog-posts on this theme on my Travels page. डॉ साब आजकल बहुत कम दर्शन हो रहे हैं. I did not know that Guwahati had so many things to see. When I plan a trip, will have to keep aside days accordingly.